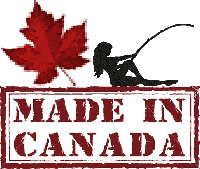 Falling Leaves Fishing - A flyguys North Fall Fishing Report! 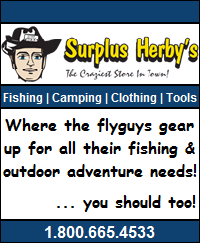 You are Here: Home >> Blog Posts >> Fishing Reports >> Falling Leaves Fishing! The weather for the month of September was awful, raining lots and the last week saw winds of 40-70 km. Not exactly good fall fishing conditions especially for the lake I was trying to get on. Finally a window of opportunity opened and I headed out to base camp ( Steve’s cabin) Thursday night after work. 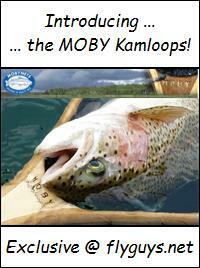 Was this going to be the fall fly fishing opportunity that I had been waiting for? Friday morning broke extremely foggy ..Oh wait that was just me. Blues sky, no wind and calling for highs of 17 C. As Steve had a buddy coming to assist wiring the cabin I gratefully borrowed his boat and headed for the lake. I was surprised to see 10-12 boats already out on the water when I arrived as most lakes up here don’t get the pressure you guys get down in the interior. I rowed across the lake and set up at one end of the long shoal weed bank/drop-off. I caught a 3 plus lb brookie in the first 15 minutes and thought this is going to be a high fish count day. now there's a nice looking fall brookie! Things though were slow the rest of the morning as I only landed a 2lb brookie to go with the first. Both were caught on a size 14 bloodworm. The problem as I saw it was there was absolutely no wind and the surface was glass. Might add that I can’t remember ever seeing this lake this calm especially all morning. I’m sure the fish were spooked and the shadow of the boat and me casting put them down. I tied a new 6 lb leader and leech on and 2 casts later hooked a bigun’. It was a long fight and I barely got him into the boat as he was too big for my net. I should’ve had my landing glove but didn’t. I removed the hook, took a quick picture and got him back in the water, revived and off. A nice plump fall rainbow trout! 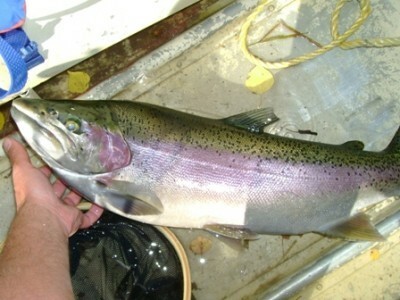 I never got a measurement but it was definitely a double digit trout. My guess 12 lbs plus! Check out the shoulders on the hog! I think that’s what kept him in the net. I caught another nice fish and using the weight calculator for rainbows. LENGTH X GIRTH X GIRTH / 800 = WEIGHT 24 x 14 x 14 =5.88 lbs. Well three nice rainbows in an hour then everything just shut down again. Nothing for the rest of the day. Hoping to get out there one more time but the ice could be here in 3-4 weeks. The leaves are almost all gone now. Kinda depressing when you think about it. 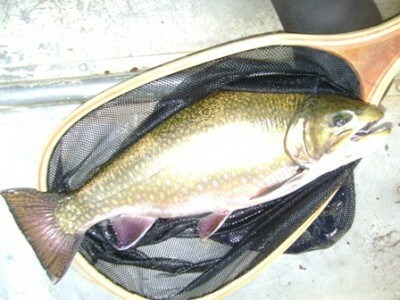 This entry was posted in Fishing Reports and tagged Eastern Brook Trout, Fall Lake Fishing, Kamloops Rainbow Trout. Bookmark the permalink.